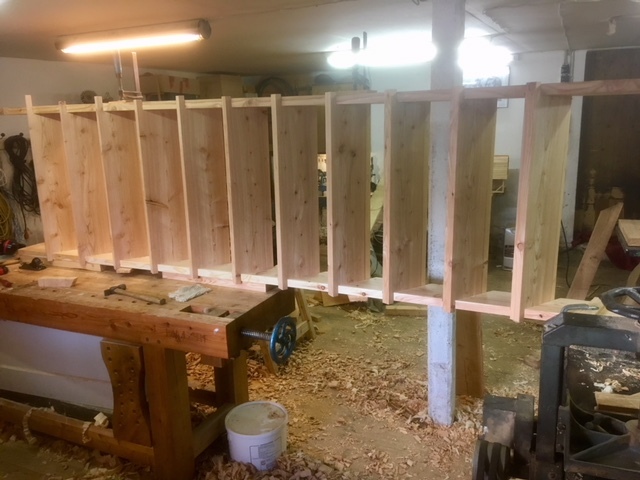 Mulesaw: A small barn for the summer house 16, staircase installed. A small barn for the summer house 16, staircase installed. After preparing all the individual steps of the staircase, I hand planed them front and back plus the upside before mounting them in the stringers. I had to keep reminding myself that it is for a barn, so I shouldn't go all wild in trying to achieve some show surface on the underside. Mounting the steps was straight forward. But as I discovered, doing this on top of the workbench wasn't a smart idea. I had to apply a couple of clamps to keep everything together so I could lift it down to the ground where I would be able to hammer in some nails. A little bit of forward thinking would have been nice here.. (but that is not my strongest card). I hammered in one nail per step, and then turned the assembly over so I could square it up before pounding in the nails from the other side. When I had bashed in all the nails on that side I again flipped it over and hammered in the last set of nails on the first side. My idea was that if I had put in both nails in the first side straight away, it might have been more difficult to square it up. The individual steps were sawed flush to the side that will be facing the wall, and sawed at an angle to the side facing the room. This is something I have seen on most old stairs, and I like the subtle elegance of this ornamentation. The completed staircase was loaded into my trailer and I drove it to the summerhouse. While maneuvering the assembly out of the shop I became aware that it wasn't very easy to move around single handed. But I managed in the end. At the small barn, I mounted the assembly by means of a bit of ingenuity, a cargo securing strap and a couple of clamps. As per Mettes suggestion, I have wrapped up the barn project for this time, since I'll be heading back to work in a weeks time. Mounting the steps in a stringer. This would have been smarter to do at the floor. The only decorative elements of the staircase. Well done! Just don't try navigating it with a BAC higher than 3.5.
hahaha, That will mainly be a problem for Gustav and his friends. They regularly use the summerhouse and barn for weekend sleep overs with beers etc. It looks like a folding attic ladder. Maybe you could hinge it in the middle and save the floor space? I already nailed it to the floor, and I am not that fond of folding ladders. But I deliberately made it rather steep to save some floor space, and also to make sure that there was space for exiting the stairs on the upstairs. Looks like it turned out really well. Thanks a lot for the nice comment, and sorry for the late reply. That barn is looking nice! The construction of the stairs are a great touch. Thanks a lot for the nice comment. I'm sorry for the late reply, but Friday-Sunday are usually busy for me so I rarely turn on the computer. Too much family stuff going on, like driving someone to soccer practice talking the dog for a good long walk etc. Do you not intend to install any kind of hand railing? I haven't quite decided yet. But I don't think that I will install any. I like to keep it very simple, and it won't see a lot of traffic. I might make a simple handrail to go on the same side as the wall. I think that a hand rail on the "open" side will complicate the potential moving of large stuff to and from the attic. I do think that I will install some sort of fence/rail in the attic though, to prevent anybody from accidentally falling through the hole. Good idea. That will be a good precaution for the 3.5 BAC problem. Beautiful, but I can feel your end of day pain. It looks like a heavy, awkward, sucker. I agree on the railing, just a small one on the wall should be all that is needed.